Today marked the first day of meteorological winter and it sure didn't feel like it. Highs across the area climbed well into the upper 60s and even low 70s in some places. This is certainly several degrees warmer than I expected and will likely impact how tomorrow's wintry mess pans out. First things first, a cold front continues to sag southeast towards our area. Checkout the 24 hour temperature changes this is already bringing..
Light rain showers will continue to spread into the area this evening with temperatures still well above freezing. Colder air will usher in as winds become northerly with the passage of the cold front. The question then becomes where does the 32 degree line setup (both at the surface and aloft) and how quickly does this cold air erode during the day Tuesday. This is a bit different than our typical cold air damming (cad) event since the wedge actually has to work its way in as opposed to being in place at the onset of precipitation. Below is a sounding showing the temperature profile of the atmosphere over Harrisonburg....the bottom is near the surface....while the top is over 40,000 feet up. The black highlighted line is the 32 degree line. At 5-7 thousand feet up there is a pronounced warm nose which will melt snowflakes that fall through it...which is why snow isn't really on the table with this. As the melted snow flakes continue falling, they run into a deep freezing layer at 3-5 thousand feet above the surface which can cause refreezing into sleet pellets. 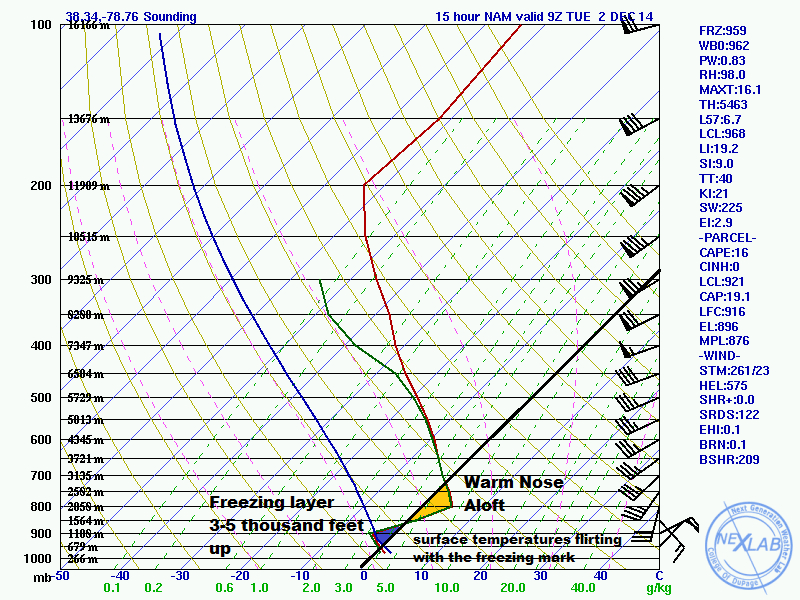 This sounding is for 5 am but this temperature profile will be changing throughout the day. A few degrees difference in any of these layers changes things completely and is part of what makes cold air damming events so tricky. Timing: On and off light showers through this evening...Higher elevations north and west will start to transition to sleet after midnight...Parts of the far western Valley will start to see this transition a few hours later. Worst impacts will be in the 4am-10am window when temperatures are hovering right around freezing and the sun hasn't taken effect yet. On and off drizzle/showers will linger throughout the day and into Tuesday night. 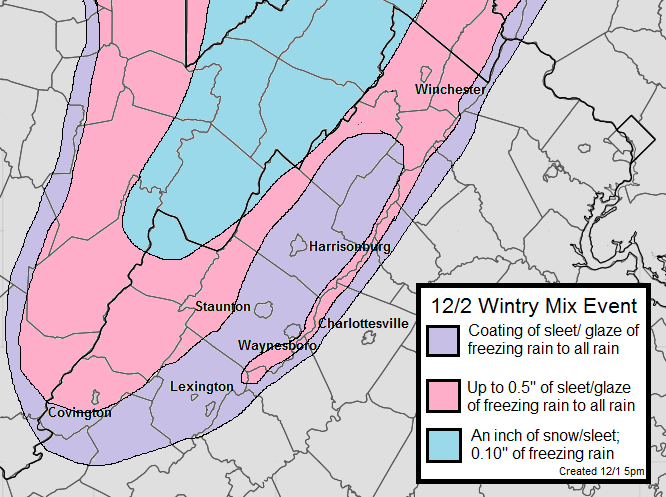 There will likely be a transition period from sleet to freezing rain for a time before going to plain rain with temperatures rising just above freezing. As always, take it slow on the roads tomorrow. It doesn't take much sleet/freezing rain to slicken up the roads and I'm pretty sure we'll see quite a few school delays and closings. There shouldn't be enough ice to cause power issues, but it's always better to be prepared for that just in case.